"Skating is not only a dream, it's also my best friend and my whole life"
Su Fei Qian is a UFO. She never shows up, and when she does, she takes away everything in her path. Luckily for her opponents, she does but a few competitions per year, or they would all have sunk into chronic depression. She took part in only 6 competitions in 2013, and yet she scored the maximum Best-5 (1600), and ties #1 Daria Kuznetsova who only keeps her crown because of her higher number of competitions (16). Double winner in Battle and Classic at Shanghai Slalom Open, Classic winner in Lishui, she is above all the double winner of the Worlds, in Classic for the second year in a row and in Battle for the third year in a row. Her only misstep of the year is for Lishui's Battle where she is outrunned by the variety of current #3, Polish Klaudia Hartmanis. A blessing in disguise, according to her. C.S. You hold a very curious record: 6 competitions in the year and you score the maximum Best-5 of 1600. You win everything, why don't you compete more? SFQ.I've been in love with skating since I was very young. I like competition too, I would love to join every competition, but I need to study and go to school, so that I only can go to competitions during my holidays. C.S. Will you go to Paris this year for the PSWC, like Feng Hui in 2013? SFQ.I want to go there, it’s Sebastien and Chloe’s hometown, who are the predecessors of the discipline and persons I respect. I also want to see some famous spots like Eiffel Tower, Notre Dame de Paris etc. My school is 'friendly school' with Kohl Montagny High School (Metz, France) and I have a good friendship with more than 20 schoolmates who are from France. In a word, I love France, I'm looking forward for the Paris Open this year, and despite everything I will participate in that event. C.S. Who are your most dangerous opponents? SFQ. Daria Kuznetsova, Klaudia Hartmanis, Zoé Granjon, Maryna Boiko Maryna, Olga Semenikhina and my team mate Meng Yun. They are all my opponents. ...In Battle? Zoé and Klaudia. They have good skills and they improve so fast in each year… and they have an advantage with their unique personal skills. ...In Classic? My team mate Meng Yun. She is a versatile skater with perfect skills. She is also good at creating choreographies, but she doesn't pay enough attention to her tricks. C.S. Which skater do you admire? ...Girl freestyler? I admire Maryna Boiko for hanging on her dream for many years and never giving up. ...Boy freestyler? KSJ and Guo Fang because they are both creative skaters, they have special and nice tricks with a high technique level. C.S. What do you think of European skater's style? SFQ. I think European skaters are very good, I learnt a lot of things from them. They have a concise style, their movements are smooth, with power and good rhythm sensation. to lose the first place at Lishui"
C.S. What happened at Lishui Battle? It was the only time you didn't win in 2013, finishing 2nd after Klaudia Hartmanis (1st). SFQ. First of all I need to thank and congratulate Klaudia Hartmanis. The Champion title had never left me since 2011 Beijing master, a serie of victories that made me proud and made me take my rivals lightly. 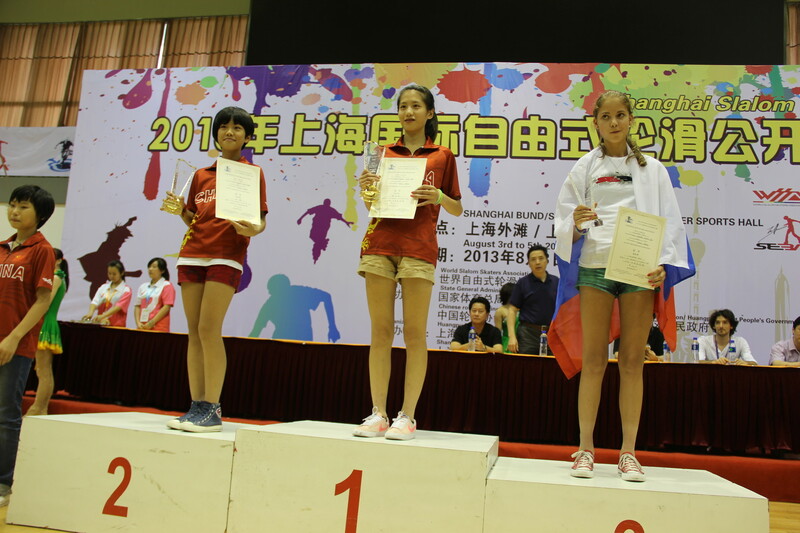 I think it was a good thing for me to lose the first place at Lishui. I was surprised that European skaters had such a fast and huge skill improvement in battle. Klaudia's victory was like a call that warned me to attach importance to it. So I practiced more and I got the 1st place back at the WFSC. C.S. How long do you need to create your classic runs? SFQ. Normally I spend 10 days to prepare it. I go to some music website to choose some good music, then I create the choreography based on it. "I can only spend 3 hours a week for training"
C.S. How much do you train every week? SFQ. My studies and homeworks take too much of my private time, I can only spend 3 hours a week for training, but I train every day when I’m in holiday. C.S. What new tricks did you work in 2013? SFQ. I'd like to create some new tricks, like I did at the 2013 Shanghai Open: toe wheeling shift with one cone swan, and reverse wheeling heel shift with one cone reverse wheeling swan. "the biggest concern for me is my mindset"
SFQ. I want to join more competitions and get more world titles in 2014. I also I want to defend my titles at the WFSC and he ARSC. Now the biggest concern for me is my mindset. if I can overcome this, I think I will be stronger. SFQ. I hope I could compete with even strongest opponents, in order for me to find my weaknesses. I grew up with skating, it's part of my life. Skating is not only my dream, it's also my best friend and my whole life.